Bookmarks are links you save to pages you want to visit again. Open the page you want to add to bookmarks. In the window that opens, select the appropriate folder and click Done. Tip. If you want to move a bookmark to a new folder, click More in the window. In the window that opens, click New folder and enter the folder name. Click Save. Click → Bookmarks → Create bookmark. Press Ctrl + D (on Windows) or ⌘ + D (on macOS). Under the Tableau, click All bookmarks. Select the bookmark folder from the list on the left. If you synced your browser on different devices, folders named after the device (such as Smartphone or Tablet) appear in the menu on the left. For more information, see Tab syncing. If you imported tabs from a different browser, then the folders that you moved also appear in the menu on the left. Your folder names will remain the same. For more information, read the Import bookmarks section. Tip. To sort bookmarks alphabetically, click → Reorder by title in the upper-right corner of the page. Bookmarks and bookmark folders are displayed on the Bookmarks bar below the SmartBox. Click → Bookmarks → Show bookmarks bar. In the Show bookmarks bar section, select either Always or Only in Tableau (if you only want to see the bookmarks bar when you open a new bookmark). Click Ctrl + Shift + B (on Windows) or ⌘ + Shift + B (on macOS). By default, the bookmarks bar only displays site names. You can opt to display favicons next to site names. If you want to save space in the bookmark bar, you can display the favicon without the site name. In the Show bookmarks bar section, select the Show icons option. The bookmark bar should be enabled. The Show icons option is enabled in settings. Find the bookmark in the bookmark panel. Open the context menu and select Edit. In the Bookmark window, clear the Name field. If several people use your browser, create a personal profile for each of them. Then other peoples' bookmarks won't display in your list. 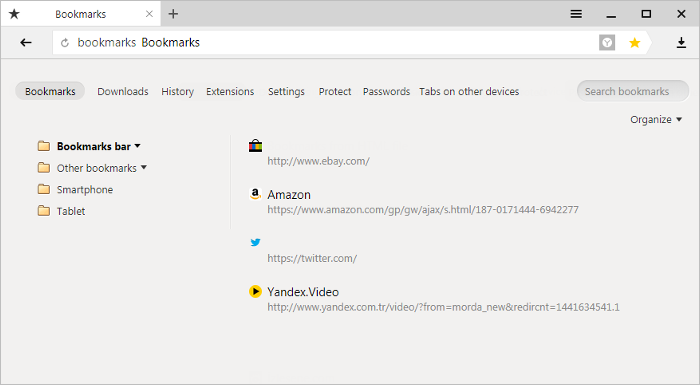 Click → Bookmarks → Bookmark manager. Open the context menu for the bookmark and click Edit. Edit the bookmark name. If you want a website's favicon to display in the bookmark panel instead of its name, clear the bookmark name field. Tip. To rename a folder, right-click on it and select Rename. Edit folder names. Open the context menu for the bookmark or folder and click Delete. Hold your cursor on the bookmark you want to move. Move the bookmark to another folder by holding down your left mouse button. On the left side of the page, select the folder where you want to create a new folder. At the right side of the page, click → Add folder. Edit your folder names and press Enter. Click → Bookmarks → Import bookmarks. 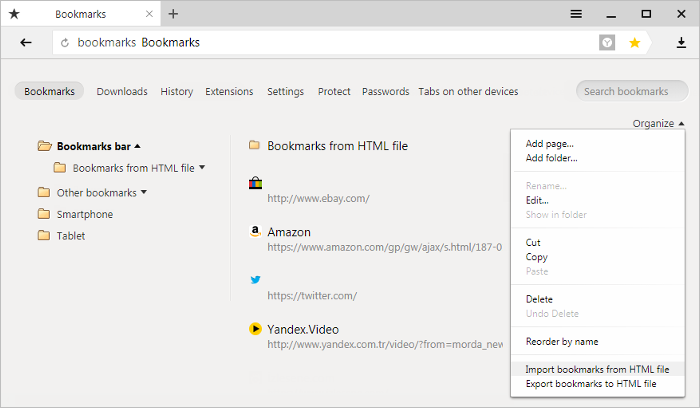 In the Import bookmarks and settings window, choose the browser you want to import bookmarks from. Select the Favorites and bookmarks option (if you only want to import these settings, uncheck all the other options). Click the Import button. A window opens notifying you that your bookmarks were successfully imported. You can also select the option Always show the bookmarks bar option. In the upper-right corner of the page, click → Import bookmarks from HTML file. Enter the file containing your bookmarks and click Open. to the root of the bookmark tree, if the browser have not had any bookmarks. You can rename, move or delete a bookmark folder. For more information, see Actions with bookmarks. In the upper-right corner of the page, click → Export bookmarks to HTML file. Select a place to save your bookmarks file. 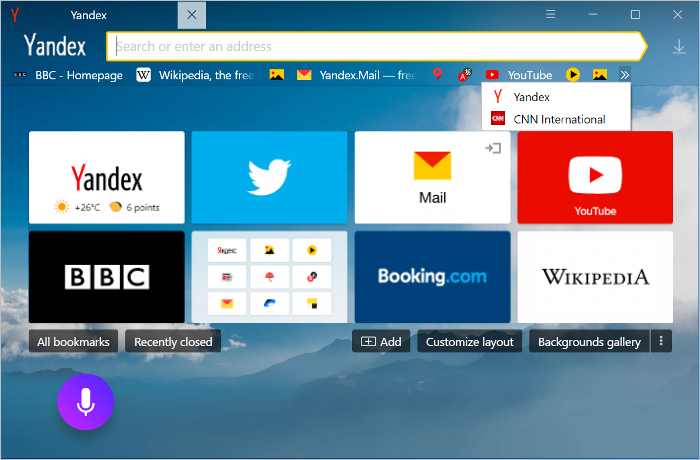 After syncing, your browser will display bookmarks from all of your other synced devices (computers, tablets, and smartphones). 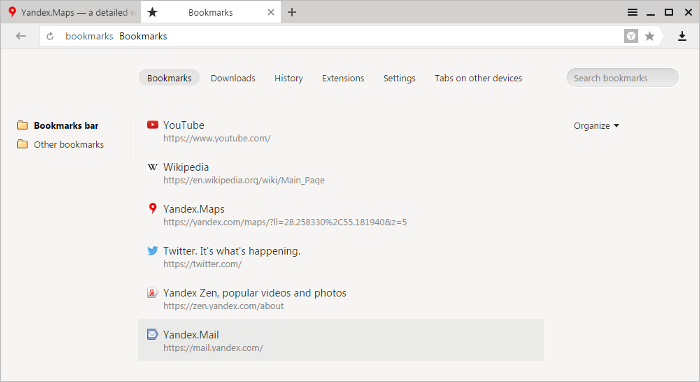 If you add or delete bookmarks on one device, then these changes will be reflected on your other devices, as long as they're connected to the internet. If you create bookmarks for the same page on different devices, then the bookmark that syncs with the server first will be saved. Bookmarks from devices of the same type are combined into one list. For example, if syncing is enabled on two computers and your smartphone, you will see a Computer section in your smartphone bookmarks where you can find bookmarks from both computers. In the list of folders to the left, select a device. After doing this, your bookmarks from other devices will not display in the Bookmark Manager. Bookmarks.bakis the bookmark backup file. They are located in the C:\Users\Your account name\AppData\Local\Yandex\YandexBrowser\User Data\Default (to see the AppData folder, enable the hidden folder display). Let's say the browser has a Name bookmark. Its details are stored in the Bookmarks file. When you delete a bookmark, the Bookmarks file changes: the Name details are immediately deleted from it. 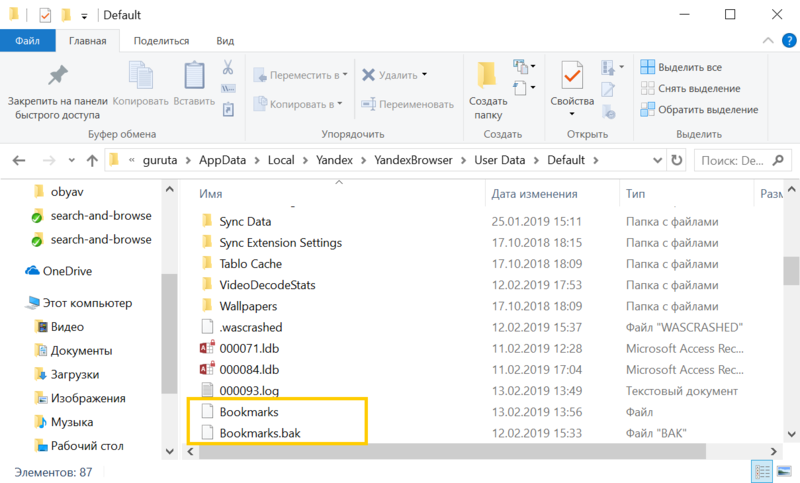 The Bookmarks.bak file does not change immediately after you have deleted a bookmark. It still keeps the Name details. Only after restarting the browser overwrites Bookmarks.bak with the Bookmarks content. Then the bookmark Name is completely removed from the computer. Move the Bookmarks file to another folder, e.g., on Desktop. Go back to the C:\Users\Your account name\AppData\Local\Yandex\YandexBrowser\User Data\Default directory. Rename the Bookmarks.bak file to Bookmarks. If your bookmarks didn't restore, return the Bookmarks file to the directory. Use the feedback form to contact tech support about this issue.